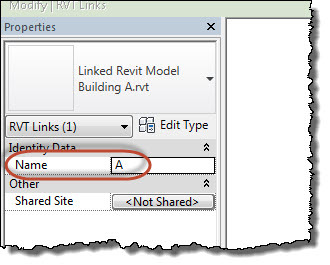 When you examine the Visibility/Graphics dialog you'll find each Revit file you've linked is shown in a list under the Revit Links tab. In this example I've linked Building A, B and C into a host model. The Project Browser shows three linked files and Visibility/Graphics shows the same three but also shows one child link beneath the top level row for each link. 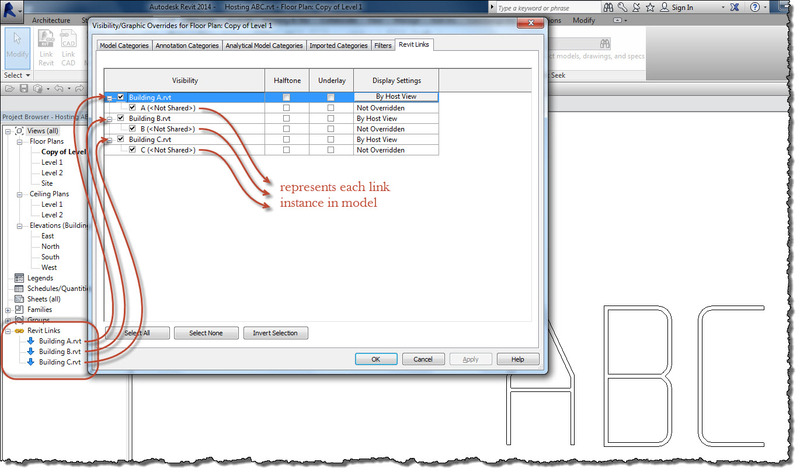 The top level row for each link is the definition of the linked file while the child beneath it represents the actual instance that is placed in the model. The single child for each link provides a way to customize the appearance of the individual linked file apart from the parent definition. Ordinarily this would NOT be required. If overrides are necessary it is sufficient and appropriate to just alter the definition (top level) only. However if for some reason you were to use two instances of Building A and Building C the Visibility/Graphics dialog would look more like this, while the Project Browser would remain unchanged. The new child rows listed for Building A and C are the result of copying the originals for each to a new location. Each new row provides us with the ability to use Visibility/Graphic overrides for each child differently if necessary. For example, I could turn off the first instance of Building C without affecting the second instance. As you can see, the upper Building C is off now. I could also use the button that appears in the Display Settings column to override individual instances of the linked files. If I want to alter both copies the same way I just need to change the top level definition. I start by checking the option "Override display settings for this instance", choosing Custom, activating the Model Categories tab and then changing the Model Categories drop down to Custom. Now I can override individual model categories in just one instance of the two copies of the linked file. The link names you see are not default values, I changed them via the Name parameter in the Properties palette. When worksets are involved the top level is assigned to the Type Parameter "Workset" and the child has its own instance parameter for "Workset" too. This means the definition can be assigned to a workset but each instance can be assigned to different worksets. If you see more than one child instance of a linked file and there should only be one child that probably means someone has copied a link inadvertently. If you can't tell then it's likely they used Copy to Clipboard followed by Paste Aligned to Same Place and there are two instances on top of each other. Since it's been so easy to accidentally select a link I see this happen fairly often. It can create some confusion when people are trying to override graphics and their efforts don't seem to work. There may be another copy lurking underneath. 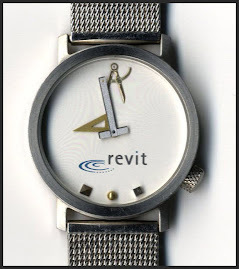 I often wondered why I would need to use this feature, until I had an issue where the Architects model had all new build and existing in the same model. Typically I don't want to see any floors or framing from the Architects model for new build, as I would document that structurally. 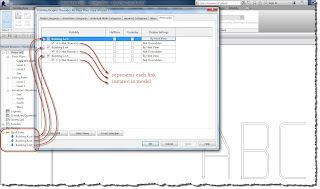 Arch Link 2 - I turn on but then also turn off either the phase for new, or worksets for new depending on the project. This workflow has worked quite well for me.